1 Who is Sheryl Goddard? 6 Sheryl Goddard on Social Media – Is Sheryl Goddard on Instagram? Sheryl Goddard was born in 1957, in the United States of America, and is a dancer, ballet instructor, and dance choreographer, but probably best known for her marriage to singer, songwriter, and actor Alice Cooper. He is known as the Godfather of Shock Rock, and one of the biggest heavy metal influencers of our time. The two have been married for over four decades, and are known for their strong and faithful relationship. How rich is Sheryl Goddard? As of early-2018, although she doesn’t publicise her wealth, sources estimate a net worth that is over $5 million, earned through success in her various endeavors. Her wealth has also been elevated by her husband’s success, with Alice Cooper having a net worth that is over $40 million. As she continues her endeavors, it is expected that her wealth will also continue to increase. Sheryl didn’t know much about the world of rock ‘n’ roll when she met Alice Cooper. While attending a Los Angeles dance academy, the students were told about dance auditions for the Alice Cooper global tour, entitled Welcome to My Nightmare. She was already trained as a ballerina at the time, and was more informed about classical music than rock ‘n’ roll. However, Sheryl would win one of only two spots left available to join the tour, which proved successful, and it was the first time that there was what journalists called the marriage of rock and Broadway. During one night on the tour, musicians and dancers gathered in Alice’s hotel suite to watch horror movies and eat pizza, during which Sheryl and Alice started a conversation which ended with a kiss, and their courtship began. Prior to meeting Sheryl, Alice has been known to have been a part of relationships with high profile names including Cindy Lang, Cyrinda Foxe, and Queenia. After dating for a year, the two decided to marry, and the ceremony was held in 1976 in Acapulco, Mexico. They settled in Paradise Valley in a home which was previously Alice’s, a 2,000 square foot bachelor pad. They would go on to have three children, who would try and pursue the same careers as their parents, in dancing, music or acting. 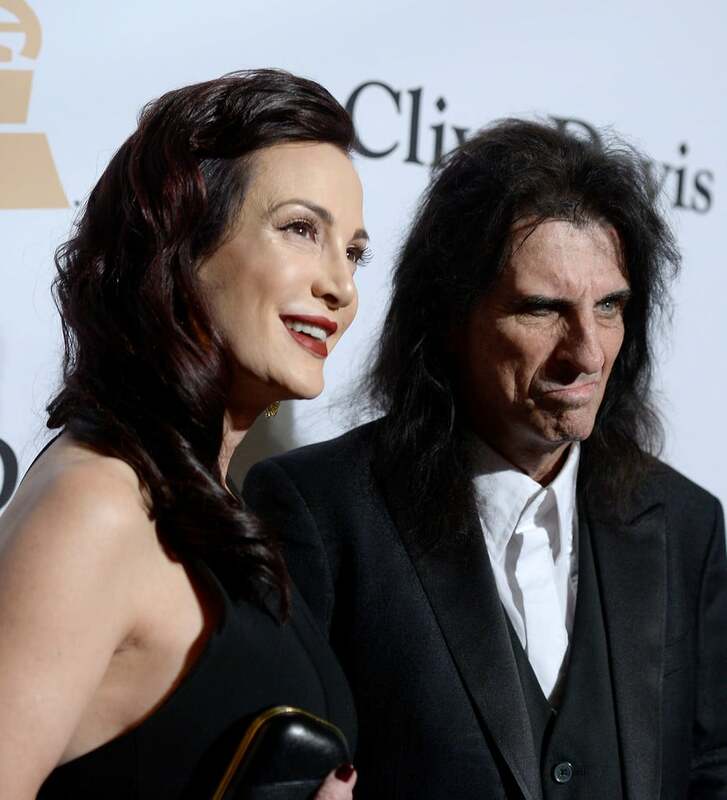 She would stay with Alice and support him throughout his music career, and Cooper is known to have been faithful to his wife, despite the many temptations of a rock ‘n’ roll career. There was only one reported incident of a problem in their marriage, when Goddard decided to file for divorce against her husband in 1983. During the time, Cooper suffered from alcoholism which was damaging his relationships and family. He eventually overcame his addiction, and the two reconciled their relationship. Cooper also went on to help other musicians, and be a mentor to those who are also suffering from addiction problems. Megadeth front man Dave Mustaine has credited Alice as one of the reasons he overcame his drug and alcohol addictions. At the end of Alice’s music career the two often go out to play golf or go to dance classes. The two have maintained their bodies through physical activity even at their age. They also enjoy watching television, going out to get sushi, and taking care of their children. Sheryl has stated that it was a good thing that their children didn’t have many troubles during their teen years, and went on to pursue their career goals. The couple credit the reason their children grew up well is because their parents are in love. The family is also very active when it comes to religion, and they attend the Camelback Bible Church located in Paradise Family. Goddard often teaches members of the church aerobics, exercises and dance. Alice also credits God for taking away his desire to drink alcohol. The two are also known for their charity work, with the non-profit group Solid Rock, which serves inner-city teens. The organization is focused in Scottsdale, Arizona, in locations where gang troubles are well known. Sheryl Goddard on Social Media – Is Sheryl Goddard on Instagram? There are numerous profiles with the name Sheryl Goddard on the major social media pages Facebook, Twitter, and Instagram but none of them belong to her. These pages are usually blank, with no information, or people who just share the same name. There are fan pages on Facebook dedicated to both Alice Cooper and Sheryl Cooper, but these are maintained by fans and not the actual celebrities. On the other hand, Alice Cooper is very active on social media, particularly on Twitter on which he sells merchandise and promotes some of both his old and recent performances. He also continues to be a guest on various television and radio shows, and in publications. He’s been recently actively talking about his faith, and how he is a born-again Christian.